Opened in 1998. Newly renovated in 2011. 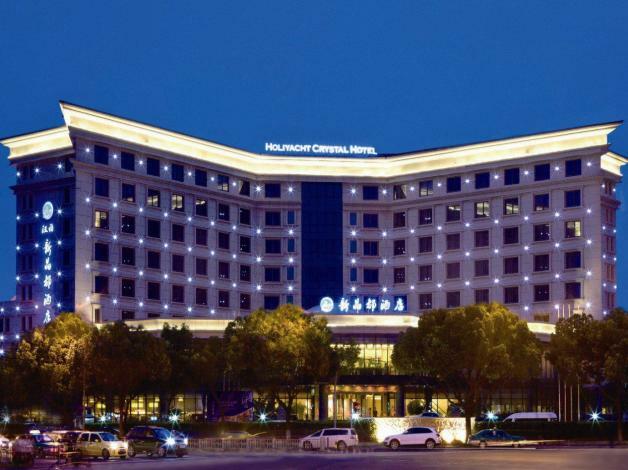 The Holiyacht Crystal Hotel (Hanya Jingdu Jiudian) is a four-star business hotel located within proximity to Ningbo East Railway Station. The hotel boasts 161 guest rooms of different classes, each of which offering a sense of elegancy and fashion. The 24-hour services provided are intended to create the very best hospitality during guests' stay. Junyue Lobby Bar is in a simple but fashion style, with beautiful and romantic music. Junlin Restaurant on the first floor offers a wide number of choices for delicacies, particularly seafood from the East China Sea. In addition, the hotel offers a variety of banquet halls and private dining rooms to suit your event. For business travelers, all six multifunctional meeting rooms are equipped with free wireless broadband Internet access and advanced audio-visual systems, which are adjustable to individual needs and can accommodate meetings of different sizes. Jingxian Function Room features the latest audio-visual equipment and automatic lighting adjustment system. The 450 sq m hall is the ideal place for large scale conferences, banquets and entertainment. When it comes to recreation, the hotel has a complete set of facilities including spa center, fitness center, and beauty salon. - 4 km to Tianyi Square.